The Christian Wife Life: the sad tale of the loss of Jordan's wedding ring. the sad tale of the loss of Jordan's wedding ring. I might as well go ahead and tell y'all the story that everyone wants to hear. How I got my bruises and how Jordan had his wedding ring taken from him by force. I say that because he didn't just "lose" it. You'll see. On our third day of the trip we rented scooters. No, not Razor scooters, but moped type scooters. That needs to be its own story so I'll talk about that later. But we rode them to a place called "China Walls" to have a picnic. It was beautiful. Although it's quite far from the shore, waves are created here against the wall of rocks and break against them. It's lovely and unknown to most tourists. There were a few locals here and a couple surfers when we came. We even had a little Jordan photo shoot. What a model he is. There were a couple people jumping in off of the rocks at that point. It looked fun so we thought we might come back later. We did come back later in the afternoon. There were some more people there and more surfers. You'd think that since there were more surfers closer to the walls we'd realize that the waves were much bigger and crashing much sooner than earlier. But no. We didn't even think about it. This is where we jumped off into the water. Now, let me explain, as I referenced in my lessons from Hawaii, that I do NOT normally jump off of things into bodies of water. So why did I this time? Well, I felt like a wimp all day because I wasn't so great at driving a scooter. I think my crying tally that day was at three. So when Jordan said he wanted to jump into the water, and I saw that it wasn't a huge cliff, I wanted to be cool. I wanted to impress him. I wanted to be more adventurous. You know how people always say not to underestimate yourself? That you can do more than you think you can and it's just a mental battle? Well sometimes you just need to actually estimate yourself. And realize that you probably should refrain from something that could be treacherous. Like this situation. So I jumped in. The water was cold. I'm not a great swimmer. I just learned how to not hold my nose underwater if that tells you how great a swimmer I am. Then Jordan jumped in. He gave me a kiss. Yay, we were swimming in the deep water of the Pacific, we were living it up, we were loving it, we were on an adventure! And then the first wave hit us and all fun came to a screeching halt. Let me just pause here and say that the ocean is friggin scary. It doesn't hold back. It just does its own thing with all kinds of power and strength. Now I see why when I was little my parents made me use a hot pink float and watched me like a hawk when I was in the ocean. It's brutal. So the wave came and was much bigger than the ones we had seen at our picnic time. We realized that we probably shouldn't stay in much longer. But it's not like there's a metal ladder over to the side that you can climb up or anything. Just rocks. So what we had seen people do was to go over to the rocks, wait for a wave to come to lift you up to a ledge, and climb up. It looked a lot easier than it was, that's for sure. Oh yeah, and these "people" I'm referring to were local surfers who were all over 180 pounds. So Jordan got over to the rock wall and I was trying to get there but it was taking me a while. I was so close to being there when another wave came. Jordan knew it would sweep me away so he reached out to me to bring me over to the rock. This was when I first got scared. He successfully grabbed my hand just as the wave came and pulled me to him, but he had to grab on to the rocks to hold us in that spot. When we came up from the wave, the look on Jordan's face took my breath. It was a look of shock and panic, and all he was saying was "Oh my goodness. Oh my goodness." "The wave took my wedding ring. It's gone." When Jordan grabbed onto the rock and his hand slipped, the wave swept it away. At that point, I just wanted to be out. I wanted to get out as fast as possible. It was hard to breathe. I guess I was panicking. I kept saying, "Let's just get out. We need to get out." Jordan tried to lift me up to the ledge, but the rocks were so slippery. I fell off and knew that we couldn't do it right there. A surfer who was kinda near us shouted over that another spot was easier to get up. So we went around the rock to the other side of it where there were pieces sticking out to hold onto. Jordan lifted me up again and I grabbed on. Then, all I heard was the surfer shouting, "You just gotta hold on!" A huge wave was coming. So I closed my eyes and did what he said. I held on. Jordan says that I disappeared in the wave and he thought that when the wave had passed I was going to be gone. But somehow, through God's help, I stayed on that rock. After the wave was gone, I climbed the rest of the way up as fast as I could and threw myself onto the top of the rock, completely out of breath and shaking all over. Jordan came up soon after that. He's a strong guy - I knew he'd be able to do it much easier than me. We stood up and just hugged each other for a while. The locals around us probably were looking at us thinking that we were the biggest idiots but we didn't care. I was so glad I had kept on my Keen shoes because they helped me grip as I climbed the rock. I had almost taken them off, but I decided not to at the last second. I hadn't felt the pain during the whole ordeal, but my legs started to throb, and there was blood running down my left leg. We held a towel to it for a minute and then we got outta there. I cried most of the way back to the hotel with so many emotions running through me. Relief that we were fine, sadness that the ring I put on his finger on March 19th was gone, thankfulness to God for protecting us and for giving Jordan the strength to help me, and still feelings of fear from all we had experienced. Number four on the crying tally for the day, soon to be followed by number five at the hotel. Jordan was upset about the ring but so thankful that we were okay. We sat at the hotel for a while just calming down from the crazy day we had. We prayed together and praised our Lord for His protection. It was truly a great bonding experience for us. I wouldn't recommend it as a marriage strengthening activity, but that's what happened. It's kind of hard to explain I guess. So now I have bruises and cuts all over me and a resolve to never jump into the ocean again, and the Pacific Ocean has Jordan's wedding ring. But I'm so thankful for a husband who spiritually AND literally lifts me up, and who is always my hero. Whether he has a ring on his finger or not. *By the way, if you don't believe how crazy hard it was or think I'm exaggerating (Ashlee! haha), read these reviews about China Walls or this little article. Probably should have read them before I jumped in. Oh, Ashley.. my heart sank when I read the title. Steve lost his wedding ring around our 5 year marriage mark, but the day after we bought his new one, he found his old one.. which I wear proudly on my middle finger on my left hand next to my wedding bands. I realize you will not get his band back... but what you learned in the act of marriage is worth more than the band. What an ordeal you had! I have to say that as I read this entry, there was something I wanted you to think of as well... Your marriage is going to go through some rough times. There are going to be days that you don't think you can get through or are going to make it because of one thing or another... but just HOLD ON TO EACH OTHER through it all and you will come to sit on the Rock of Christ to find you are safe. You may be a bit battered and bruised... you may have lost something you cherished along the way.... but the experience taught you more than you will ever realize. Keep this story close to your heart and think of that when you hit hard times. I am just thankful you both are OK. I must admit... I have a few tears in my eyes right now. God is good. Thankful you're safe. Well my sweet daughter, I read this and had to walk away for a bit. I prayed for safety and protection along with memories to last you a lifetime...and seems by what you shared here that the Lord was gracious and mighty as He answered my prayers. Jordan's ring is replaceable although that one was most precious to each of you for sure! What I realize more each time I read this is how much Jordan cherishes YOU. He only had one focus at that moment and it was YOU and getting YOU where he was. So, if possible, my love and respect for him just climbed a little higher. I will look forward to hearing and reading more of the amazing time you two had there and hope my heart can take it! LYM! So, so thankful for the Lord's protection. How easily we could have been dealing with a different outcome! Each day is a gift and you truly are a gift to Jordan and our family! So glad you guys are both okay! That could have been a sad ending but the Lord was definitely watching over you guys. Girl, you are so brave. 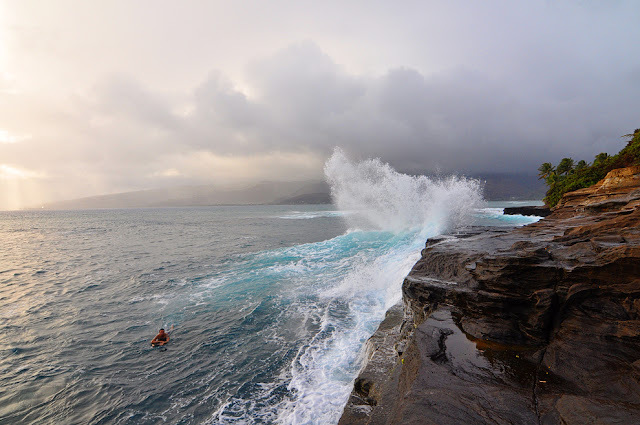 We went here too on our Hawaii trip and I wouldn't even let Justin walk out very far b/c I was so scared of the waves! How scary! That sounds really really scary!!!! I'm glad you are both ok! Hopefully your bruises will go away soon!!! Hope you get Jordan a new ring soon too! Looks like you had a great time though!! !